I’m glad to see FlexoJobs going again after launching our new platform. We hope you like it. I thought I’d use this blog to occasionally share my thoughts on employment-related stuff. Here goes my first try! Besides a profile here on FlexoJobs, I also have a LinkedIn profile where I offer my services to the industry. On LinkedIn, I am seeing more flexo press operators. That’s very cool. As a fellow job seeker, I find that having a LinkedIn profile is critical. Employers are likely to look for our LinkedIn accounts. They probably HAVE LinkedIn accounts! I recently did some cleaning up of my own LinkedIn profile. There's a lot of advice out there about doing it. I filled out every section I could. I uploaded a current picture of myself. I checked my privacy settings. I did a bunch of little things to make it look as professional and appropriate for my market as I could. I looked at every setting and gave it careful consideration. I strongly suggest that all of you do the same. Of course, I also want you to keep being a member of FlexoJobs and invite your flexo colleagues and friends to join us. 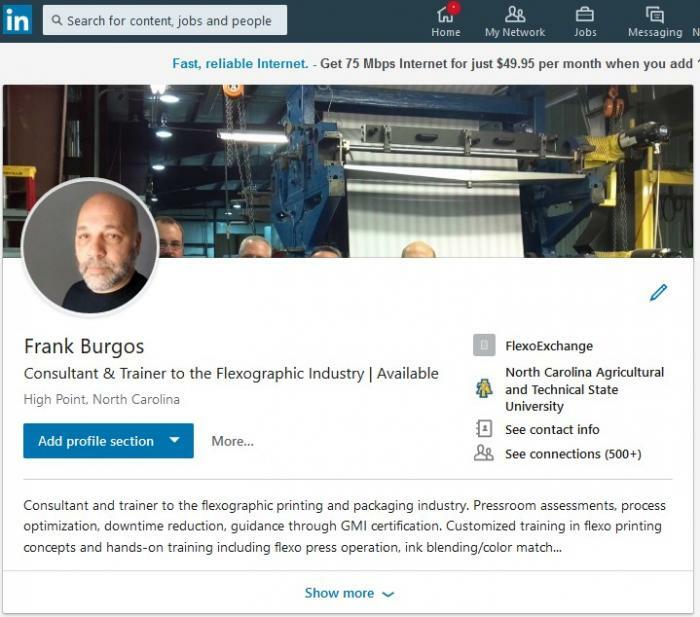 At FlexoJobs, we’re dedicated to the flexo industry and are happy to provide you with a platform where, unlike LinkedIn, the only thing prospective employers are every going to see is folks related to the flexo industry. And that is very cool, too.